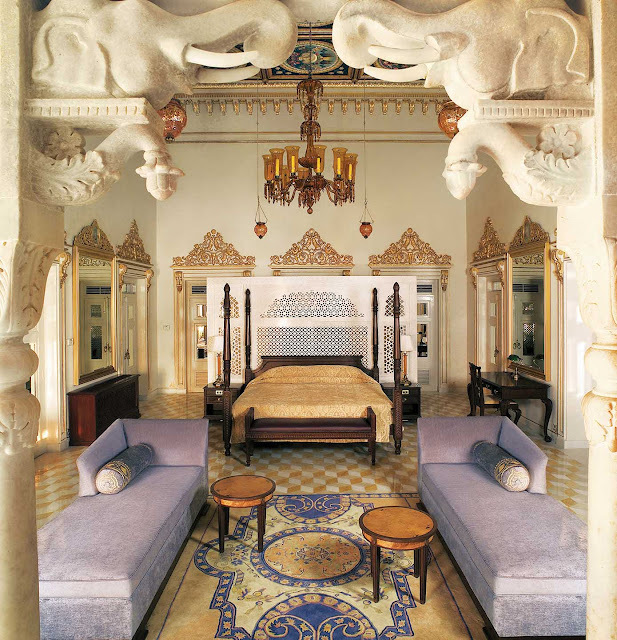 Come with me to discover the cultural life of remote regions of India, and the enchanting Lake Palace hotel in Udaipur. 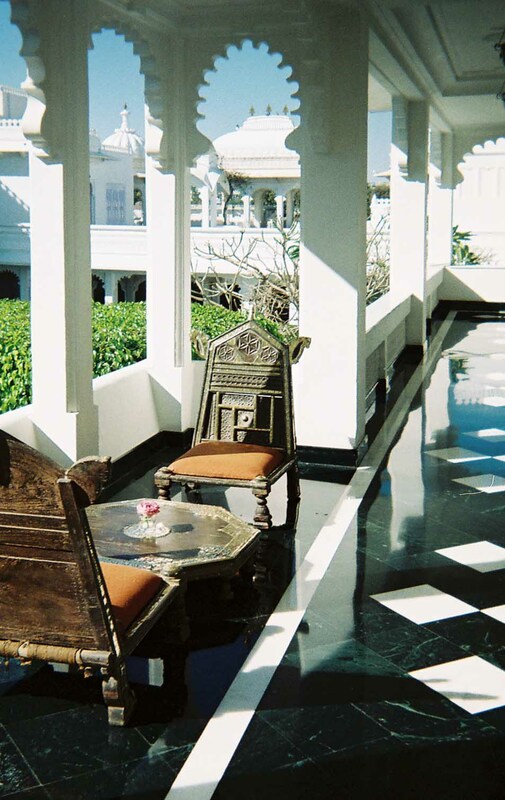 I stayed at the Taj Lake Palace recently, and loved the elegance and exoticism of this hotel. It floats on Lake Pichola facing Udaipur, the legendary historic town in Rajasthan, northwest India. I encountered colorful and enchanting village celebrations en route. I found myself caught up in a surreal choreography of hot pink and orange saris, the jangle of hallucinogenic Bollywood-style music, and a moving celebration of centuries-old tribal life. You’ll see my vivid impromptu photos below. And I discovered that for this trip, staying close to the hotel was my ideal. Come with me to see why I never wanted to leave. 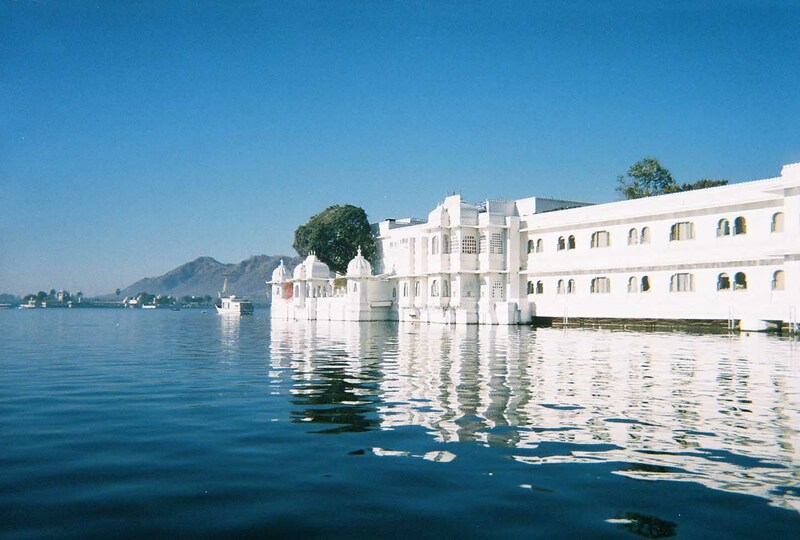 There, in the middle of the silvery lake, surrounded by blue-haze hills, is the vision of the lovely Taj Lake Palace. As elegant as a classic white yacht, it’s the former summer palace of the Maharana of Udaipur and his family and court. It was to this palace that the regal family escaped the summer heat. Within a few minutes boat ride from their imposing palace, generations of the family whiled away their days with music, dancing, puppet shows, boat rides, fireworks displays (an India art), and lavish parties. Now, the palace is an ultra-private hotel. Only registered guests can take a boat and arrive there. Security is extremely strict. It’s a favorite of honeymoon couples from around the world. I’m always surprised how many young couples in Delhi or Jaipur or Tokyo tell me that they spent their honeymoon at the Lake Palace. 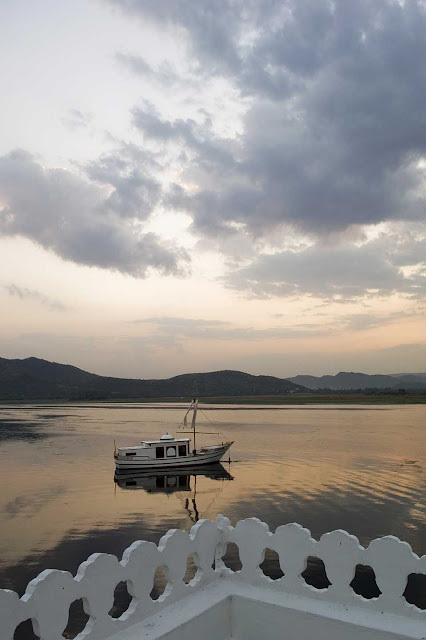 International travelers (who may have spent 26 hours in transit to get there) and Indian residents love the privacy, the lake setting, and the hotel’s very low-key approach to quiet luxury. It’s the kind of hotel where guests arrive by boat, and are escorted straight to their rooms and suites, never to be seen. There’s no lobby scene, just discreet staff greeting guests. Except at the boat landing dock, in the evening at the roof terrace restaurant, or late in the evening after dinner, or at the nightly dance performance, I hardly saw anyone. Perfect. The indoor restaurant and the rooftop terrice offer views of the beautifully lit Palace of the King of Mewar and of Lake Pichola. Restaurant features delicacies including seafood and meats including seasonal soft-shell crabs, Canadian wild salmon, Australian lamb, and Muscovy duck, as well as India classic dishes. Vegetarian specialties include a variety of fresh vegetables, rice dishes of the region, tofu, white asparagus, and the traditional tali selections. I always eat Indian dishes. 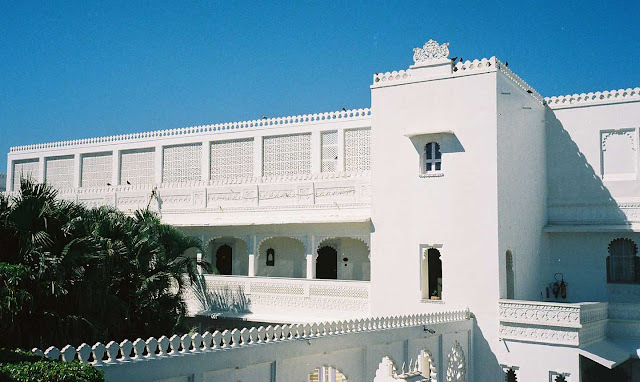 The palace was built in 1743- 1746 [under the direction of the Maharana Jagat Singh II] (the 62nd successor to the royal dynasty of Mewar) of Udaipur, Rajasthan as a royal summer palace and was initially called Jagniwas after its founder. The palace is set on four acres, but floats on the water like a boat. It was constructed facing east, allowing its inhabitants to pray to Surya (Hindu Sun god) as the sun came up over the surrounding hills. 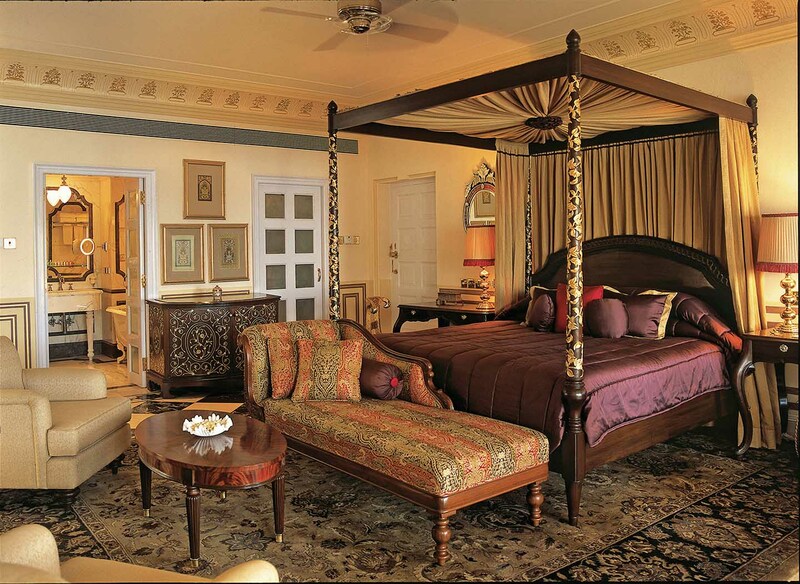 Over the centuries the royal family held sway in the region, and the lake palace remained a private refuge. My first evening, as I went out on a shikara for a sunset sail, we passed a fort-like stone structure on an island some distance from the hotel. This was where generations of maharanas kept munitions and explosives ready for battle (and a safe distance from the palace). It was also where fireworks for summer celebrations were kept. That evening, from a palace balcony, I saw a fireworks display on a nearby island (also owned by the maharana) in celebration of a wedding. Lovely. I wanted more. The Maharana owns the palaces and much of the land around the lake—and he has strictly controlled watercraft on the lake. Only the little boats that ferry guests back and forth are allowed. It’s silent. It’s tranquil. Early one morning, I saw some fishermen in a hand-carved wooden boat paddling just beyond the hotel, but otherwise, just as cruise ships do not allow craft to approach, the Lake Palace is off-limits to anyone but overnight guests. It’s not even possible to come across the water for dinner. Even after British rule ended in the forties, and princely states were abolished, the maharana and successive rulers used this cool haven as their summer resort, holding their regal meetings of leaders, and traditional religious ceremonies and observations, and weddings. In 1971, Taj Hotels Resorts and Palaces took over management of the palace. The hotel now has just 73 rooms and suites, extensive sheltered gardens, a discreetly placed swimming pool with a view of the City Palace, and rooftops and terraces and niches and cupolas where guests can remain hidden and private. Lunch, dinner, afternoon tea, drinks and refreshments can be served in the garden, on a roof terrace, or in a turret, depending on the time of day. The Taj Group was involved in the restoration of the original property, and has continued to restore and update it over the decades, always maintaining historic murals, mirror-work, ornate carvings, marble floors, and the mood and style of the original. I admire the way the company has incorporated technology, while keeping the style and approach and look of a traditional palace. It feels residential and discreet, with a rare classic beauty. Staff at the hotel is the crème de la crème of the Taj management training programs. The room service staff, concierges, and guest services staff all maintain a very polished and calm demeanor, and are entrusted to make decisions on the spot, to stop and chat to guests who engage them, and to take the initiative. When my computer did not appear to be working one evening, a front desk manager quickly found a laptop that was ready for guest use and the hotel’s tech expert set it up. The hotel has wifi, of course, and every other amenity for modern world travelers. Everyone on staff speaks clipped English, and several other languages. 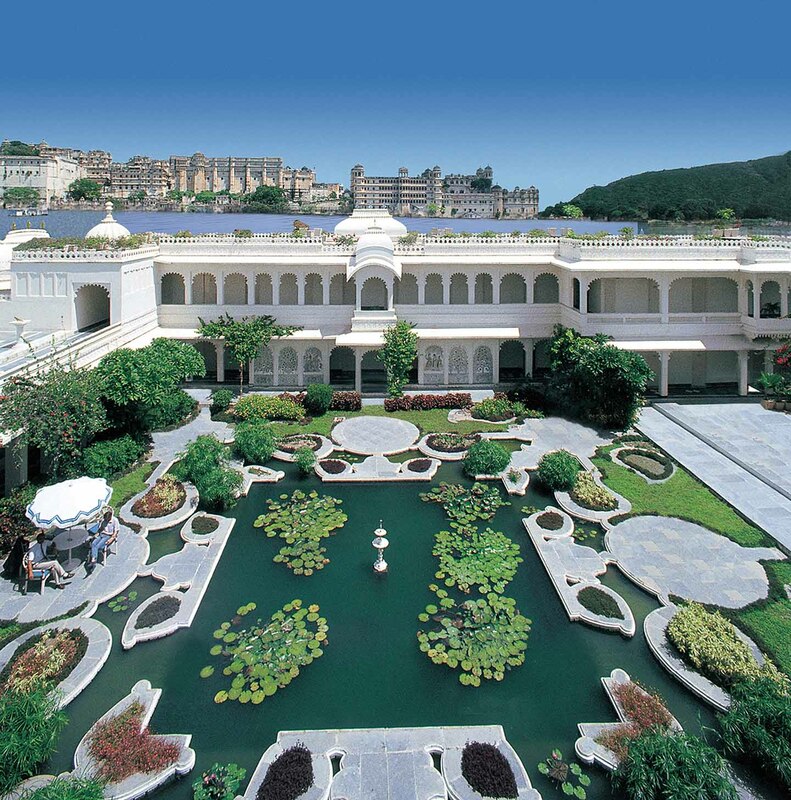 Many of them have worked in guest services roles at the Rambagh Palace, at Taj Delhi properties, and they intuitively understand how to expedite transactions. One day a sari-clad guest services manager proposed that I might like to take a boat out one evening to watch sunset across the lake. Another suggested ideal times to take a private tour of the City Palace museum, with its regal crystal chairs, embroidered textiles, thrones and collections of bibelots and royal fantasies. Other trips I could have taken includes a trip in one of the Maharana’s vintage cars (those of you who’ve read my reports on the Rambagh Palace hotel know how much I love riding in vintage Daimlers and Plymouths and historic roadsters.) I was tempted but will have to do that next time. There’s a spa boat, and a royal barge I could have sailed on. You know I’m adventurous and curious, and love new experiences. Next time. Before departing for India, I did weeks of research on Udaipur and the region in out-of-print travel books, and new books for updated information. I planned elaborately detailed day trips to historic palaces to the south, scheduled visits to restored noble forts with painted walls from the 17th century, and made lists of palatial residences with beautifully maintained gardens, as well as remote and unknown tribal villages near the Gujarat border. 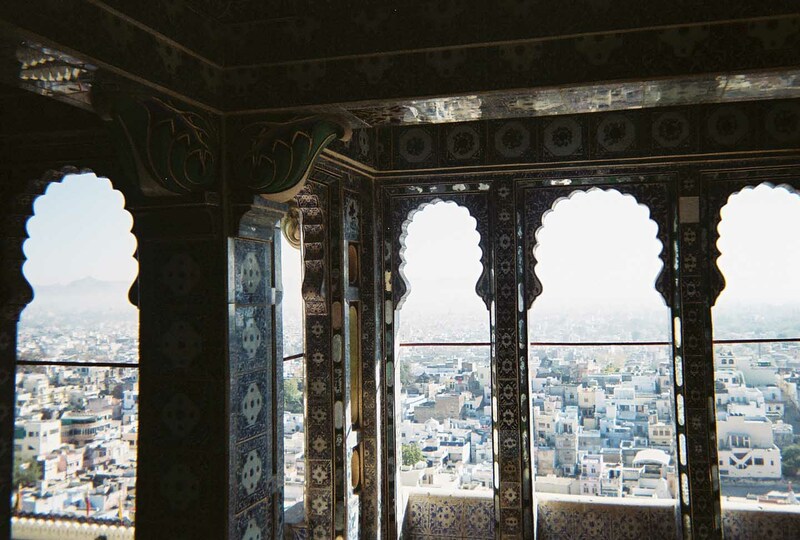 I had every day scheduled to go and find the history and mysteries of Rajasthan. It would be a week of exploration, adventures, and discovery of India’s cultural traditions, Moghul arts and culture and people living just as they have for centuries, with no Western influence, and few signs of the 21st century. The Lake Palace setting is hypnotic. I did not want to leave. The run rises over the cream sandstone City Palace, and illuminates its wedding cake confection of turrets, crenellations, balconies, towers, fretwork, terraces and moon-watching pavilions. Early morning light ripples like silk satin across the water. In the afternoon, the light turns golden and surrounding hills topped with ancient forts seem to melt into a soft haze, like a Turner painting. It’s so mesmerizing, I would request another lime soda, or take afternoon tea to a terrace, and read fitfully and stay. One early morning, I took the boat across to the City Palace to wander silently through the viewing pavilions and mirrored rooms. I stopped in at the adjacent stamp-sized Udaipur palace post office, its one-man operation and jumbled inefficiency endearingly familiar. I wrote messages and addressed some vintage post cards I’d found at a nearby art gallery, and then hand-cancelled the stamps using the lumpy and dried out stamp pad. “Madam, please place the cards on the windowsill,” said the cheerful elderly official, his eyeglasses askew. I placed them on the dusty window sill alongside random bundles of string-tied mail , and I crossed my fingers. Good fortune smiled. All five cards arrived at their destinations ten days later. I was back at the Lake Palace in time for a late lunch of biryani rice and a light piquant salad, on a shaded cupola. Indian vegetarian dishes are my favorites. 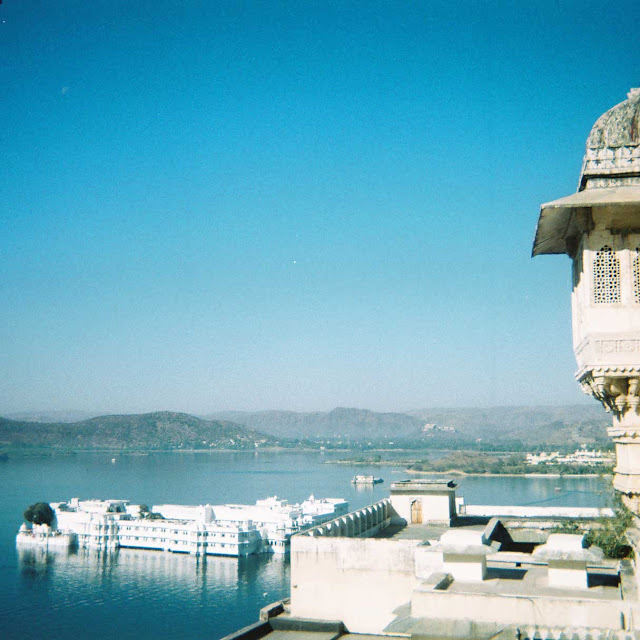 Udaipur is the key city of Rajasthan’s historic southern region of Mewar, a land of dramatic hills and remote villages. This kingdom was one of the most powerful, traditionally, in India. The leader, the great Maharana, had to defend the region from invaders, and protect the Hindu religion from marauders from the north. He was expected to have a standing army, and to protect and provide for his people. He was the most senior of all the Rajput kings. 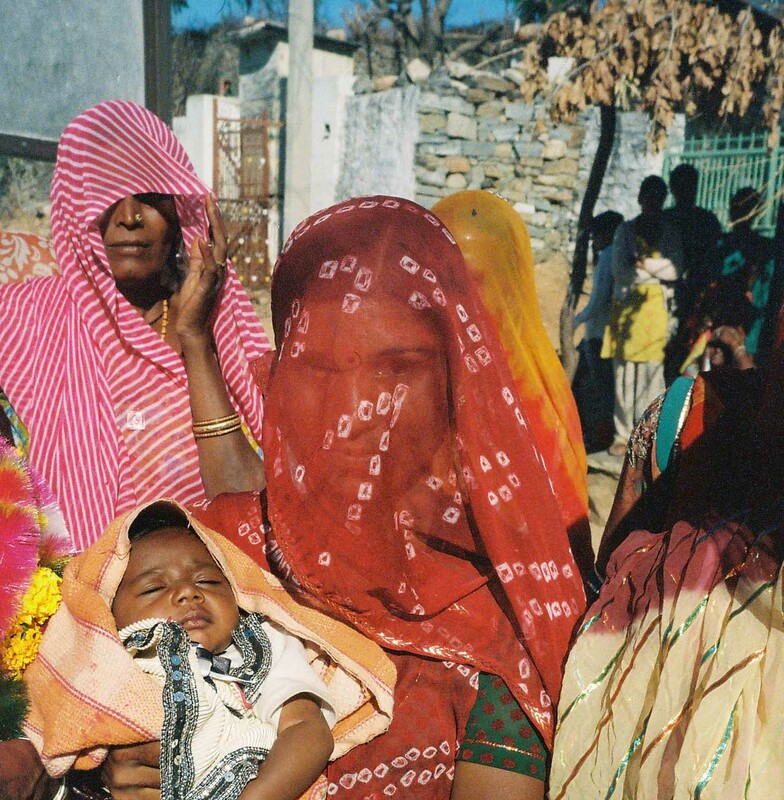 The Mewar rulers claim direct descent from the sun. 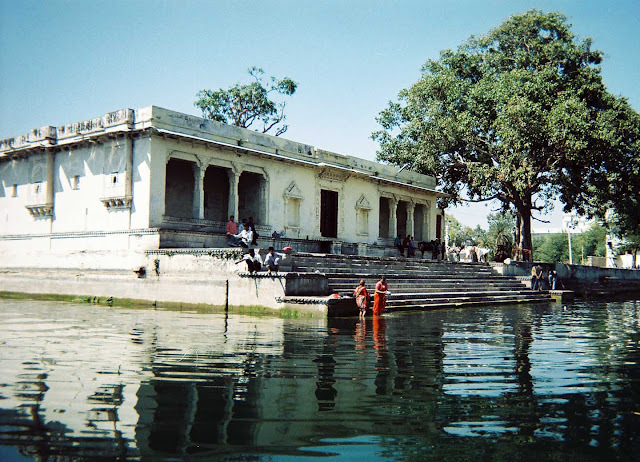 In 1599, the Maharana, defeated by the Mughal army in Chittorgarh, was advised by a hermit priest to found his new city on the banks of Lake Pichola. Thus Udaipur was born. Today it’s a city of around 300,000 people, growing fast, but still retaining a sense of old India. 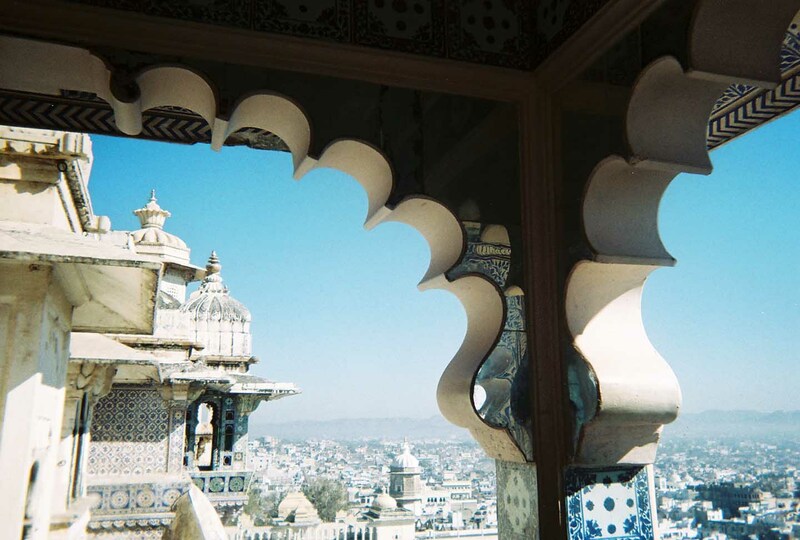 With its tangle of bazaars and towering palace buildings, Udaipur today also houses artist workshops crafting woven textiles, pottery, and tie-dye fabrics. 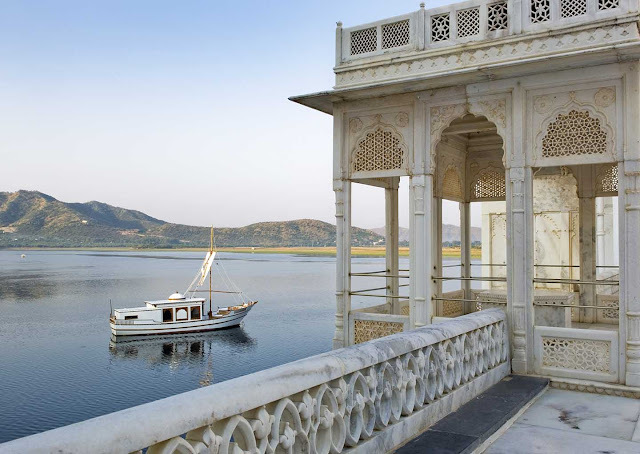 Thanks to the benevolence of the elderly and revered royal leader who carefully protects historic havelis and regal buildings, the view around the lake is harmonious. Folkloric silver jewelry, miniature paintings of the Mewar School, and natural cashmere (undyed) shawls are among elegant treasures to take home. I highly recommend a visit to the City Palace and perhaps you will be fortunate, as I was, to be invited to an awards ceremony the Maharana was conducting one evening. 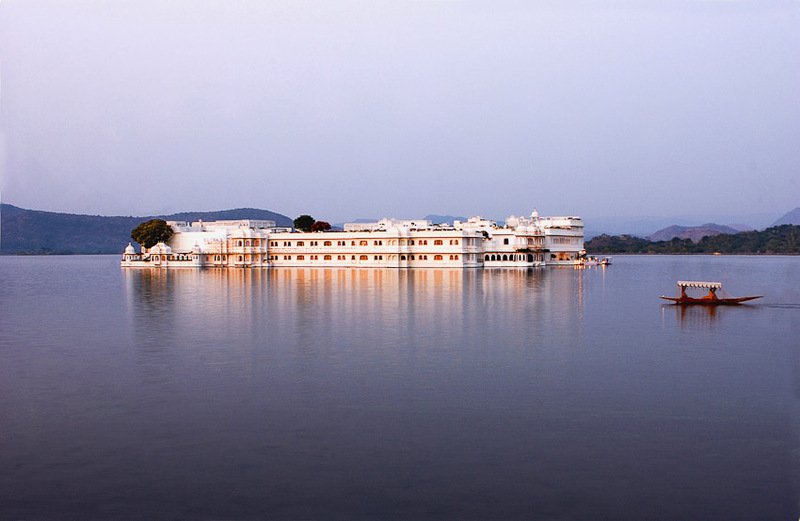 Otherwise, the best viewing is from the Lake Palace, from sunrise to sunset. To travel from the Rambagh Palace hotel in Jaipur (watch for my report in upcoming weeks) to the Lake Palace in Udaipur, I hired a car and driver. There are no direct flights from Jaipur to Udaipur. 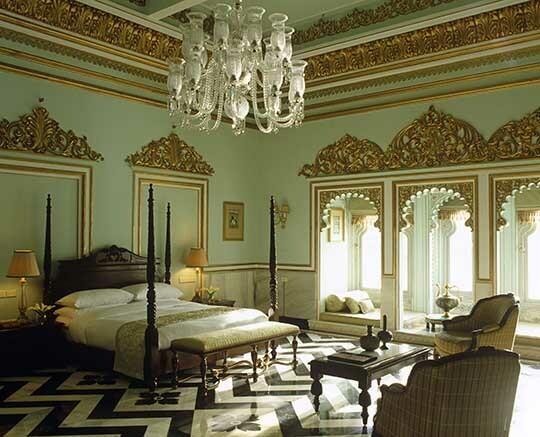 Udaipur is located in a southern corner of Rajasthan, not far from the border of the adjacent state of Gujarat. The drive west, on a fine new highway, takes around six hours, with a stop at a wayside hotel/restaurant for a refreshing lime soda, and a wander in the pretty garden. Two hours before attaining Udaipur, in the middle of nowhere, with green rice fields to the left and to the right, I heard loud drums, flutes, and arpeggios of horns, the captivating over-amped sounds of celebratory Indian music. I asked my driver to stop. 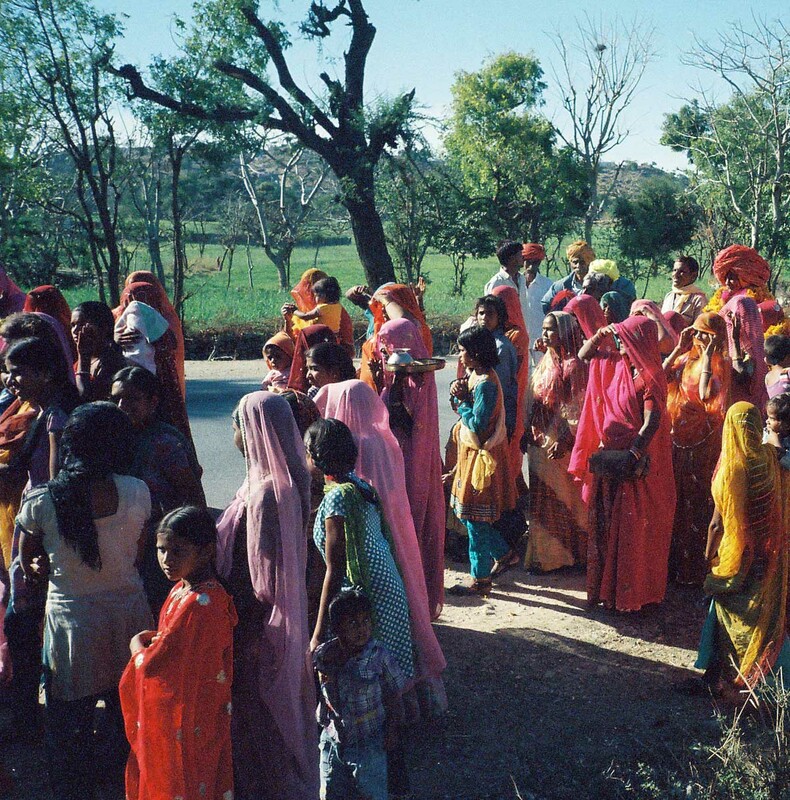 I jumped from the car, and dashed across the road into the swirl of village women dressed in their finest saris and gold jewelry, dancing and singing and following the procession. 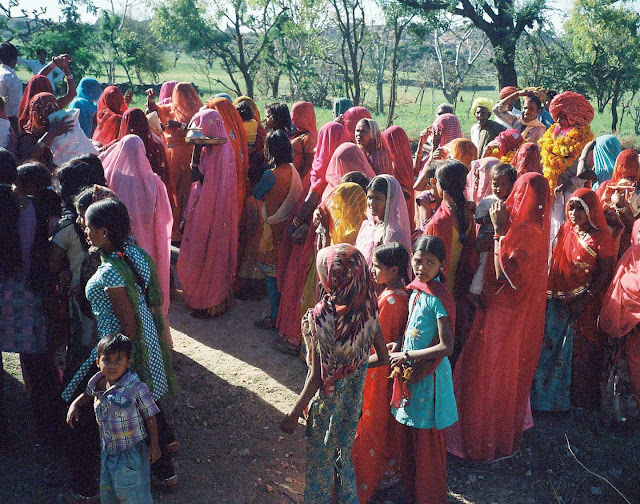 I followed, and was pelted with red dye by one of the younger girls who was dressed in a bright orange silk chiffon sari trimmed with gold sequins. The bright crimson dye, a symbol of joy and life and vitality, found its way all over my long white gauze scarf and white cotton blouse. Smudges of pinkish red looked perfectly in keeping for arriving at the hotel. It turned out that the celebration was in honor of a grand and handsome and somewhat tottery gentleman who was retiring from his lifelong railroad service, finally as head of the regional railways. 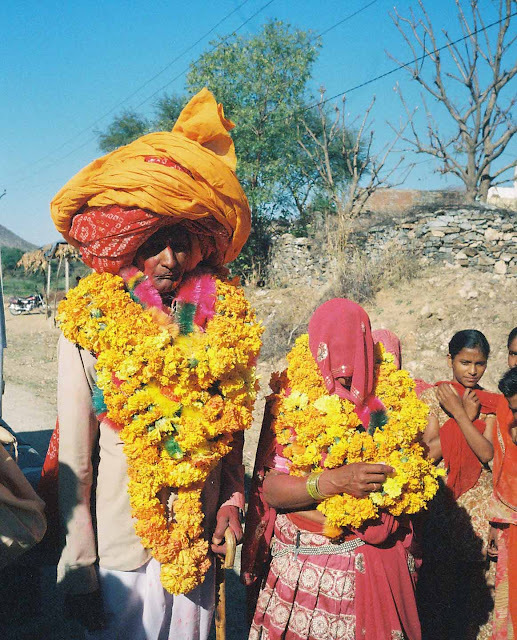 As he (and his wife, in a orange sari) walked at the head of the procession, village friends added garlands of marigold flowers, layers of yellow floral tributes around his shoulders. The tradition is also to add layers of orange and red turbans to crown his head with glory. More and more were circled in an increasingly giant turban that threatened to topple him. The music blared, the girls danced, I chatted to the local school teachers, and I admired plump sleeping babies held aloft by young mothers. I was swept along in the colorful group. I loved the spontaneous joyful bursts of singing. I was the only non-Indian person there. Eventually, the delirious group headed into the village. 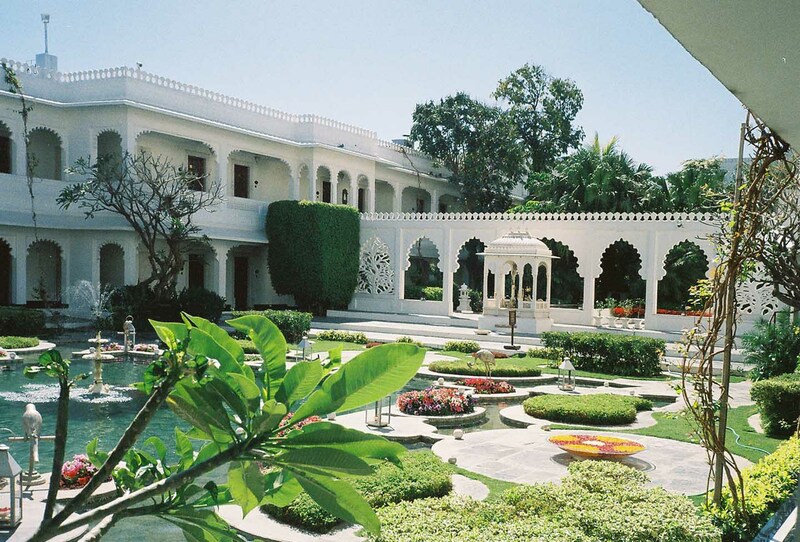 It was time for me to head on to the Lake Palace, through miles of marble factories, and swathes of green rice fields. I adored the Lake Palace. It was effortless, it was serene. But eventually it was time to depart. From the hotel boat landing and from the library, I had watched sunset shadowing a temple across the water. All day, pilgrims arrived, ladies washed clothing in the lake, men sat patiently fishing, and one afternoon an elephant was visible beneath a tree. It was an ancient Indian scene, viewed as if through some magical time travel. We smoothly curved around to the north, and slowed down as I watched children playing on the steps, women with their saris hitched about their waists washing clothes in the lake water, and, indeed, over beyond the tree, an elephant standing placidly in the sun. The lake water was dark green at this point, with reflections of the temple rippling and shimmering. It was a scene from the sixteenth-century or the nineteenth century, or perhaps the fifth, but really, a scene from the early twenty-first century, today. Magical. 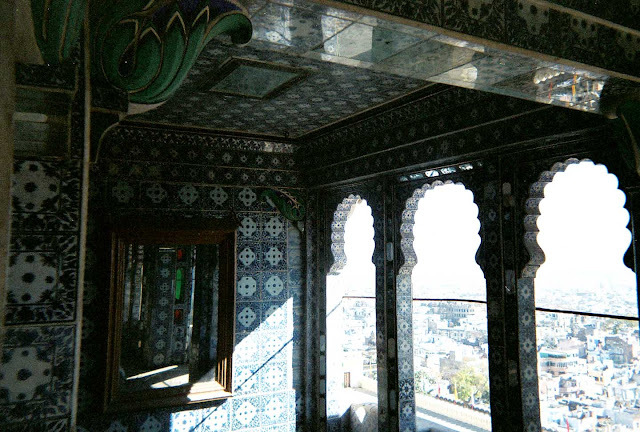 On my next visit to Udaipur, I’ll add this vantage point of land to my list of places to explore. And then I headed across the lake to the jetty. My visit (my third) to the Taj Lake Palace had been so much more relaxing and compelling than I anticipated. I’d arrived with black Moleskine notebooks full of lists of Jain temples and Mewar palaces and muraled old rooms to visit in the region. I thought I would set out early in the day to see hilltop forts, Rajput palaces, and authentic Indian village life, far from the 21st century. Instead, I embraced the peace and quiet of the water palace. It was one of the most memorable hotel visits I’ve made. 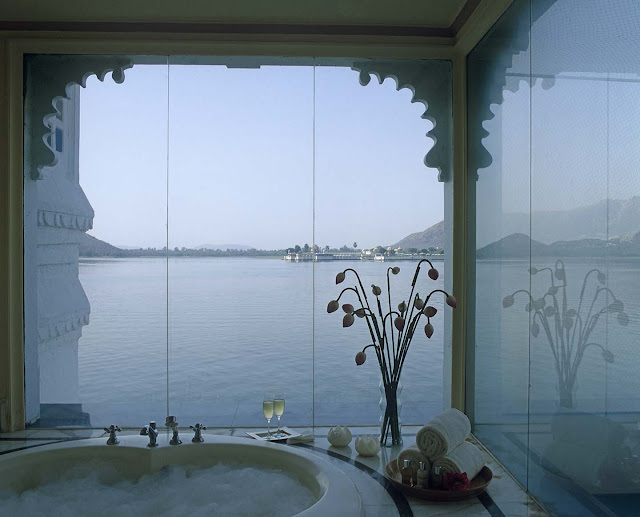 Images of the Taj Lake Palace hotel, courtesy Taj Hotels and Resorts. Used here with express permission. Photographs of the City Palace and the village celebration by Diane Dorrans Saeks. Established in 1901, Taj Hotels Resorts and Palaces is one of Asia's largest groups of hotels, comprising 100 hotels and resorts in 58 locations across India with an additional 17 international hotels in the Maldives, Malaysia, Australia, UK, USA, Bhutan, Sri Lanka, Africa and the Middle East. What a magical mystery tour. Thank you for sharing it so I could be an "arm chair traveler" with you guiding the way. Thank you for your comment.Much appreciated. Yes...I hope this inspires you to travel. I present my experience of India (traveling alone, seeing friends, spending lots of time with friends...) and my adventures in India. Important to note that I have been traveling all over India since I was a student, and I'm very much at home there. 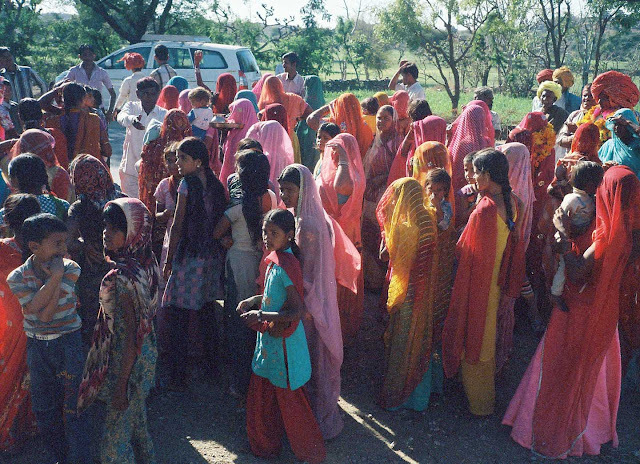 I love Indian people and especially admire that--like the village celebration I encountered and photographed here--the culture and traditions in Rajasthan in particular, are intact, for centuries. Next week you'll come with me to a new discovery, an historic fort/hotel, and to make some fantastically rare and beautiful encounters. The royal stay and the way your camera loved the Indian heritage and captured them is absolutely stunning.Thanks for the lovely post shared,do drop a while at mine there are lots to share about India. We stayed here a few years ago... By far, one of the most beautifully magical places in the world. Well worth the trip! According to my sister-in-law and her husband, both scientists who frequently visit India for weeks on end, are full of tales about the awfulness of the country, its rail system, its hotels, its .... etc. I, on the other hand, blissfully unaware of the realities, have never allowed my romantic view of what still is, for me, one of the world's most exciting countries. Now I am blissfully confirmed, thanks to your essay and those stunning photographs, in my desire to visit India. Simply unreal. To think there is a place like this. Thank you for sharing your fantastical journey. What a sumptuous post. Lake Palaces, Jaipur (the name of one of my most favourite eau de cologne), sunset, fireworks, sheltered gardens, and courtyards with fountains and a little boat which no doubt gives you access to those secret places in a landscape which are otherwise inaccessible, all took my breath away. I wonder how you do it each time to tell the most memorable stories of both past and present like a beautifully woven tapestry. With your poet's romantic eye and compass, you always succeed in conveying the atmosphere of whichever country you visit and the nature of its people. Thank you so much for this priviledge to travel with you to the most beautiful places in the world. I love your choice of background reading and literature. It's so wonderfully esoteric and yet every bit is engaging. 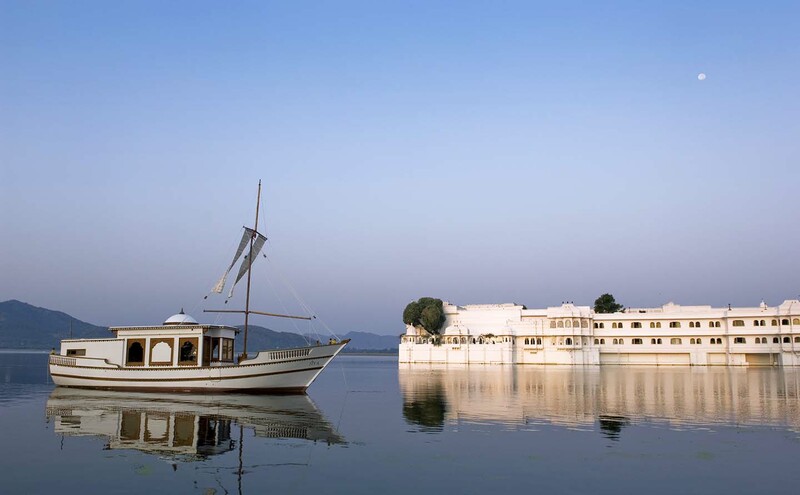 Yes, there is nothing else in the world like Lake Palace. I love that the management of the hotel is so polished--and yet for the guest it is relaxing, so understated, so non bling-bling. My accommodation was the loveliest room looking directly at the City Palace--with the sun rising in the morning and the full moon rising at night. But honeymooning couples love the palatial suites. Mine was elegant and comfortable and not palatial--and well location for views and light and not over-the-top. Yes, there are those who travel to Paris and hate the food and hate the tourists and hate everything. I have a totally different experience--and love everything in Paris and never see 'tourists'. There are those who travel to Venice...who hate Venetians and detest the tourist hordes and don't like anything. For me...I go far from tourists, never see them, love the Venetians, love the art and architecture...well, you get my drift. India: it is such a magical, vibrant and ever-seductive country. I've been traveling there since I was a student. I once spent 3 months traveling all over, with my fiancé. I am so sorry for your sister-in-law and her husband. This is their sad conclusion. The trains...you buy a first class ticket and get on the train. It's an authentic experience. The hotels! Oh, my...some of the best in the world! The vegetarian food is so fresh and healthy! Yes, crowded streets can be a surprise. Simply make other plans. You can choose to be happy. You can plan great private experiences. I hardly see travelers/tourists at all. I dive into the unknown...often, with permission, plunging into temple celebrations (see next week) and talking to priests and people. Blue--continue to wear rose-tinted spectacles...and laugh when your 'scientists' moan and complain. India--start planning. For you...RAJASTHAN is the magic. You'll see more next week on THE STYLE SALONISTE. Diane, I loved your blog about The Lake Palace. The first picture is the terrace outside of the room that Freddy and I stayed. The room itself was not nearly as large as the terrace, but when they offered us a much larger room we declined because we loved our aerie above the lake. We had cocktails with the present maharana, Shriji one evening and met a friend. You are a fortunately lady indeed. What a magical place to visit. I hope I have the good fortune to visit this hotel one day. My only trip to India was a short one to Delhi and Agra. I hope to return and visit the other fascinating areas. Thanks for sharing your stunning adventure. You are right. I am fortunate. I am also very grateful to be healthy enough to make long distance travel part of my agenda. And when I return, I work 7 days a week...night and day...on all my projects and assignments and books, which I love. An utterly dreamy, transporting and ethereal way to start my morning....thank you, Diane. Thank you so much for your lovely response. Yes...I do a lot of research for my travel--which is usually to do more research (on Indian architecture, on Indian textiles, on Indian history and culture, on weaving, on Indian jewelry (all of which I've written about extensively). And...part of my reading on India (there are so many books...) is on rare and out of print books, and even on less know, like Osbert Sitwell or Roddy Cameron, as published here. I love to read about India in the 18th C, and during the Raj, and books written by Maharanis and Maharajahs...and generals and English travelers. Much of that history is still there...and white India is modernizing (airlines are now terrific)...and changing...as you can see from my photos of the village celebration...it holds closely to tradition. 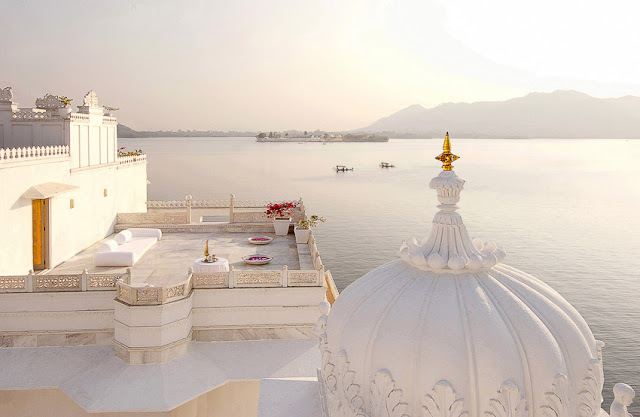 Magical and sublime...two words that describe both the Taj Lake Palace AND this blog post. Next week's post can't come soon enough. I hope it inspires you to travel to India. It is a magical country. People so friendly. I was there in spring--such a glorious fresh time. my favorite post of yours to date. what a gorgeous and inspiring place to visit and take in all around you. So unique and breathtaking. I am so in need of a vacation and I think I just had one. Thank you so much for a beautiful post on a magical place. I have only stopped in India (Bombay) once on my way to Hong Kong from London and it was 85 degrees already at 7 am. How hot was it when you were there? India--for me--is a magical place, full of surprises, delight, encounters, and vivid days. Best times to be in Northern India--are generally considered to be from October--end of March. Goa and the south and the Himalaya have different kinds of seasons. I generally like to be there when the weather is in the 70s...and warm in the evening. I wish you happy travels and great visits to India. Thank you for taking us with you! This is the India my mother loved and described to me, which I haven't experienced - yet! I just stumbled across the lake palace and mentioned it in a blog post I did a week or two ago. I love that you've provided a more in depth look and travel guide to a location that until two weeks ago I didn't know existed. What a magical place. amazing the tea table with glass table tops looks awesome here. These all furniture arrangements are fantastic. 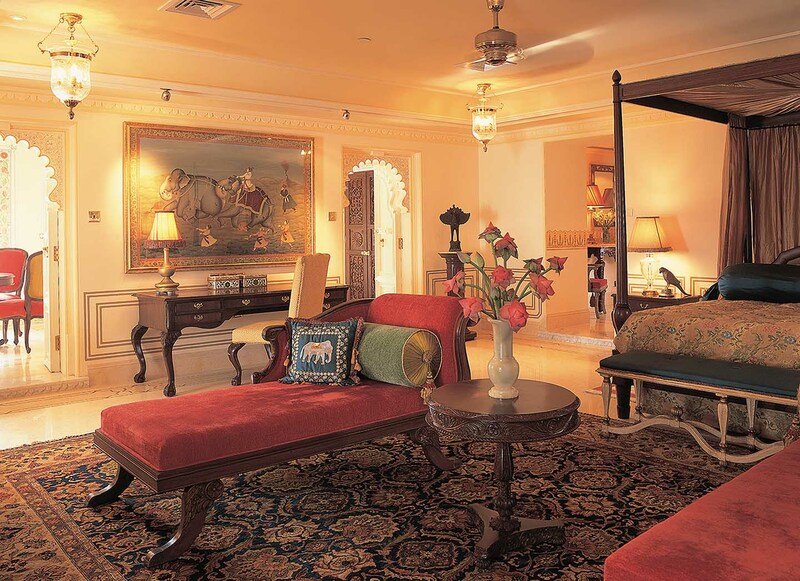 Having a visit to any historical place in Rajasthan is always a royal experience. I have been to Jaipur, Udaipur and many other tourist spots and it was really a great experience. Among all of the forts and places in Rajasthan, Udaipur lake palace really stands apart due to its extraordinary construction and stunning interior. Your images are exploring its beauty. Nice post.